How was your weekend? Any good birds? Don’t be shy… tell us about your best bird! My best bird was a Sharp-shinned Hawk standing vigil over my bird feeder. Unfortunately for the eager accipiter, the feeder hasn’t been filled for a while! Charlie founds favor with his first Great Chalfield Common Snipe. 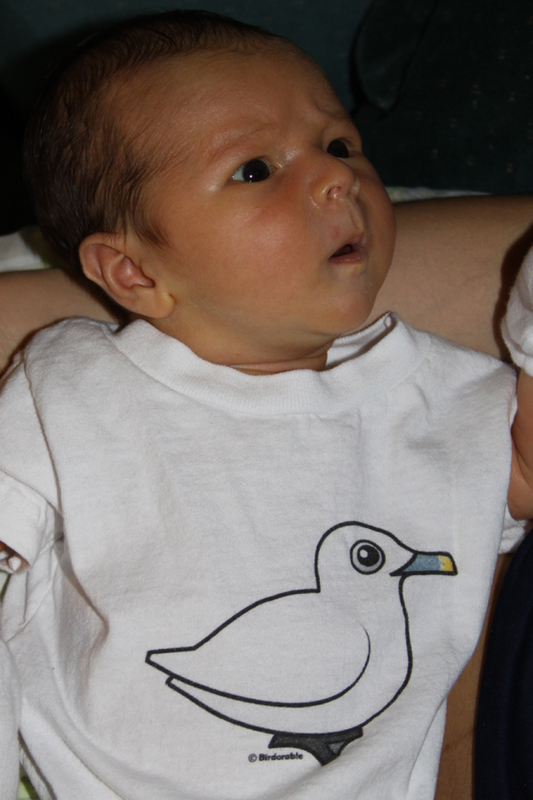 Alas for Corey, his best bird was was the Ivory Gull on his son’s Desmond’s onesie! Western Grebes in North Carolina! A successful chase for a new state bird. Found a very late Chipping Sparrow at my feeder. My rarest bird might not excite anybody else, but an American Crow just north of Tucson was notable indeed. I did ‘blog’ about it at http://birdaz.com/blog . That photo is do doggone cute! Well, I’m thrilled to admit I saw my first whooping cranes this weekend. Saw lots of other goodies, too, but the cranes really were the highlight. My best bird was a flock of about 50 white ibises north of Vicksburg, Miss. In recent years, they have begun overwintering as far north as central Texas and Mississippi. I got to watch a group of Short-eared Owls hunting a field right before sunset. It was quite entertaining. I finally got to see my winter visitor Dark-eyed Juncos and White Throated sparrows on my patio following the last freeze. I love both of those little birds. The Juncos for the incessant bickering and the White Throats for the drunken sailor whistle song I hear every morning.